Pitting the player against a docile computer-controlled character is a fine tutorial mechanic, but it’s not very exciting. Guilty Gear Xrd: Revelator has a bit more fun with fighting fundamentals. The latest game in Arc System Works’ fighting game franchise, available today on PlayStation 4 and PS3, replaces the boring old basic tutorial with a colorful trip through the basics. Movement is learned by popping balloons. Need to drill the basic attack buttons into your brain? Beat these guys up. Combos are communicated via a series of floating minions, each labeled with the attack you need to use to take them out. As a casual fighting game player (and more of a BlazBlue fan), my Guilty Gear skills really need some polishing. Giving me an experience that’s something more than a simple list of commands to perform against a stationary opponent helps me focus on learning, instead of charging online immediately, losing several matches in a row and then giving up. Does the training help? At the end of the training montage below I put my skills to the test. I won’t be entering a tournament any time soon, but at least I am enjoying myself. 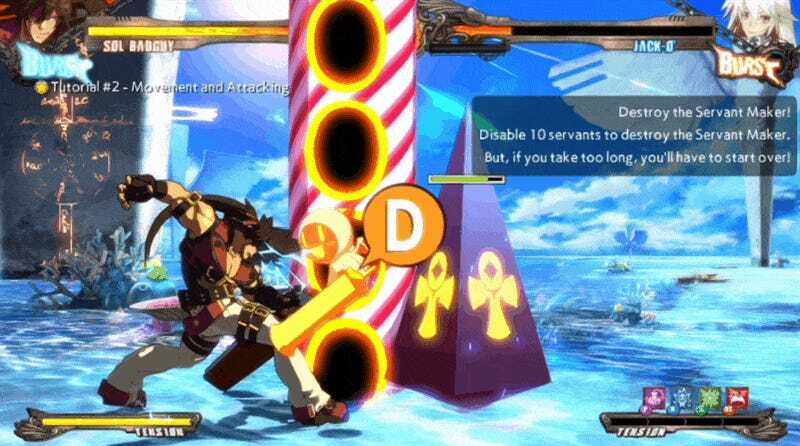 Guilty Gear Xrd: Revelator hits the PS3 and PS4 today, featuring the same gorgeous 3D-as-2D graphics I fell in love with from the last game, with new characters, new modes and new mechanics to help make the game more accessible to newcomers and more entertaining for veterans. It also advances the story, in case anyone is still paying attention.